Genuine fans take the best team moments with the less than great, and know that the games that are best forgotten make the good moments truly shine. This monumental book of the Detroit Red Wings documents all the best moments and personalities in the history of the team, but also unmasks the regrettably awful and the unflinchingly ugly. In entertaining—and unsparing—fashion, this book sparkles with Wings highlights and lowlights, from wonderful and wacky memories to the famous and infamous. Such moments include the revolutionary style of the Russian Five and the magic run of Franzén, as well as the dark sides of Jack Adams and the Richard Riot of 1955. Whether providing fond memories, goose bumps, or laughs, this portrait of the team is sure to appeal to the fan who has been through it all. Ted Kulfan is the Detroit Red Wings beat writer for the Detroit News, where he has been a sportswriter for over a decade, and has been part of several national award-winning projects. He has been featured in publications ranging from the Sporting News to Basketball Weekly and was a contributer to the book Wayne Gretzky: The Making of the Great One. He lives in Dearborn, Michigan. Larry Murphy is a color commentator for the Detroit Red Wings on Fox Sports Detroit as well as a studio analyst; he also occasionally appears on NHL on the Fly with the National Hockey League Network. He is a retired professional ice hockey defenseman, having played for teams that include the Pittsburgh Penguins during two Stanley Cup victories, and the Detroit Red Wings during another two. He is an inductee of the Hockey Hall of Fame. He lives in Detroit, Michigan. Genuine fans take the best team moments with the less than great, and know that the games that are best forgotten make the good moments truly shine. This monumental book of the Chicago White Sox documents all the best moments and personalities in the history of the team, but also unmasks the regrettably awful and the unflinchingly ugly. In entertaining—and unsparing—fashion, this book sparkles with White Sox highlights and lowlights, from wonderful and wacky memories to the famous and infamous. Such moments include the magical run to the 2005 World Series title, as well as the notorious “Black Sox Scandal” that rocked the foundation of the sport. Whether providing fond memories, goose bumps, or laughs, this portrait of the team is sure to appeal to the fan who has been through it all. Genuine fans take the best team moments with the less than great, and know that the games that are best forgotten make the good moments truly shine. This monumental book of the Detroit Tigers documents all the best moments and personalities in the history of the team, but also unmasks the regrettably awful and the unflinchingly ugly. In entertaining—and unsparing—fashion, this book sparkles with Tigers highlights and lowlights, from wonderful and wacky memories to the famous and infamous. Such moments include the impressive run to the World Series in 2006 and the clutch hitting of Kirk Gibson in 1984, as well as the horrendous years when the Tigers were in the cellar of their division and the particularly disastrous 2003 season. Whether providing fond memories, goose bumps, or laughs, this portrait of the team is sure to appeal to the fan who has been through it all. Genuine fans take the best team moments with the less than great, and know that the games that are best forgotten make the good moments truly shine. This monumental book of the Denver Broncos documents all the best moments and personalities in the history of the team, but also unmasks the regrettably awful and the unflinchingly ugly. In entertaining—and unsparing—fashion, this book sparkles with Broncos highlights and lowlights, from wonderful and wacky memories to the famous and infamous. Such moments include “Orange Monday” and the breathtaking play of John Elway, as well as the string of humbling losses in the Super Bowl and the disastrous early years, where four wins was a good season. Whether providing fond memories, goose bumps, or laughs, this portrait of the team is sure to appeal to the fan who has been through it all. Genuine fans take the best team moments with the less than great, and know that the games that are best forgotten make the good moments truly shine. This monumental book of the Buffalo Bills documents all the best moments and personalities in the history of the team, but also unmasks the regrettably awful and the unflinchingly ugly. In entertaining—and unsparing—fashion, this book sparkles with Bills highlights and lowlights, from wonderful and wacky memories to the famous and infamous. Such moments include the 50 sacks of the fearsome 1964 defense, as well as the nine turnovers of Super Bowl XVII. Whether providing fond memories, goose bumps, or laughs, this portrait of the team is sure to appeal to the fan who has been through it all. Genuine fans take the best team moments with the less than great, and know that the games that are best forgotten make the good moments truly shine. This monumental book of the San Francisco 49ers documents all the best moments and personalities in the history of the team, but also unmasks the regrettably awful and the unflinchingly ugly. In entertaining—and unsparing—fashion, this book sparkles with 49ers highlights and lowlights, from wonderful and wacky memories to the famous and infamous. Such moments include “the Catch” and the magic of Super Bowl XXIX, as well as the joke Gale Sayers made of the 49ers defense one muddy day in 1965 and the 1972 playoff loss to Dallas. Whether providing fond memories, goose bumps, or laughs, this portrait of the team is sure to appeal to the fan who has been through it all. Genuine fans take the best team moments with the less than great, and know that the games that are best forgotten make the good moments truly shine. This monumental book of the Los Angeles Lakers documents all the best moments and personalities in the history of the team, but also unmasks the regrettably awful and the unflinchingly ugly. In entertaining—and unsparing—fashion, this book sparkles with Lakers highlights and lowlights, from wonderful and wacky memories to the famous and infamous. Such moments include the 33-game winning streak of the 1960s as well as the implosion of the 2004-2005 team. Whether providing fond memories, goose bumps, or laughs, this portrait of the team is sure to appeal to the fan who has been through it all. Genuine fans take the best team moments with the less than great, and know that the games that are best forgotten make the good moments truly shine. This monumental book of the Kansas City Chiefs documents all the best moments and personalities in the history of the team, but also unmasks the regrettably awful and the unflinchingly ugly. In entertaining—and unsparing—fashion, this book sparkles with Chiefs highlights and lowlights, from wonderful and wacky memories to the famous and infamous. Such moments include the upset win over Minnesota in Super Bowl IV but also the loss to the Miami Dolphins on Christmas when Garo Yepremian’s double-overtime field goal ended the longest game of the National Football League. Whether providing fond memories, goose bumps, or laughs, this portrait of the team is sure to appeal to the fan who has been through it all. Genuine fans take the best team moments with the less than great, and know that the games that are best forgotten make the good moments truly shine. This monumental book of the New York Giants documents all the best moments and personalities in the history of the team, but also unmasks the regrettably awful and the unflinchingly ugly. In entertaining—and unsparing—fashion, this book sparkles with Giants highlights and lowlights, from wonderful and wacky memories to the famous and infamous. Such moments include Jeff Hostetler’s Super Bowl run and Lawrence Taylor’s rise to fame, as well as his career-ending tackle of Joe Theismann and the disaster that was the 1993 playoffs. Whether providing fond memories, goose bumps, or laughs, this portrait of the team is sure to appeal to the fan who has been through it all. Genuine fans take the best team moments with the less than great, and know that the games that are best forgotten make the good moments truly shine. This monumental book of the Pittsburgh Pirates documents all the best moments and personalities in the history of the team, but also unmasks the regrettably awful and the unflinchingly ugly. In entertaining—and unsparing—fashion, this book sparkles with Pirates highlights and lowlights, from wonderful and wacky memories to the famous and infamous. Such moments include the final homerun hits of the 1960 World Series by Hal Smith and Bill Mazeroski as well as the drug scandal of the early 1980s. Whether providing fond memories, goose bumps, or laughs, this portrait of the team is sure to appeal to the fan who has been through it all. Genuine fans take the best team moments with the less than great, and know that the games that are best forgotten make the good moments truly shine. This monumental book of the Cincinnati Reds documents all the best moments and personalities in the history of the team, but also unmasks the regrettably awful and the unflinchingly ugly. In entertaining—and unsparing—fashion, this book sparkles with Reds highlights and lowlights, from wonderful and wacky memories to the famous and infamous. Such moments include “the Big Red Machine” going to the World Series in 1975 and the opening of the Great American Ball Park, as well as the disastrous 1982 season and the infamous Pete Rose gambling scandal. Whether providing fond memories, goose bumps, or laughs, this portrait of the team is sure to appeal to the fan who has been through it all. Genuine fans take the best team moments with the less than great, and know that the games that are best forgotten make the good moments truly shine. This monumental book of the Minnesota Vikings documents all the best moments and personalities in the history of the team, but also unmasks the regrettably awful and the unflinchingly ugly. In entertaining—and unsparing—fashion, this book sparkles with Vikings highlights and lowlights, from wonderful and wacky memories to the famous and infamous. Such moments include the “Purple People Eaters,” as well as the 41-0 loss to the New York Giants in the 2000 National Football Conference Championship. Whether providing fond memories, goose bumps, or laughs, this portrait of the team is sure to appeal to the fan who has been through it all. Genuine fans take the best team moments with the less than great, and know that the games that are best forgotten make the good moments truly shine. This monumental book of the Philadelphia Phillies documents all the best moments and personalities in the history of the team, but also unmasks the regrettably awful and the unflinchingly ugly. In entertaining—and unsparing—fashion, this book sparkles with Phillies highlights and lowlights, from wonderful and wacky memories to the famous and infamous. Such moments include the rapturous season of the “Whiz Kids” and the magical 2008 run to the World Series, as well as the lows of the historically inept Phillies of the 1930s and the equally historic collapse of 1964. Whether providing fond memories, goose bumps, or laughs, this portrait of the team is sure to appeal to the fan who has been through it all. Genuine fans take the best team moments with the less than great, and know that the games that are best forgotten make the good moments truly shine. This monumental book of the Philadelphia Flyers documents all the best moments and personalities in the history of the team, but also unmasks the regrettably awful and the unflinchingly ugly. In entertaining—and unsparing—fashion, this book sparkles with Flyers highlights and lowlights, from wonderful and wacky memories to the famous and infamous. Such moments include the era of the “Broad Street Bullies” as well as the playoff drought in the late 1980s and early 1990s. Whether providing fond memories, goose bumps, or laughs, this portrait of the team is sure to appeal to the fan who has been through it all. Genuine fans take the best team moments with the less than great, and know that the games that are best forgotten make the good moments truly shine. This monumental book of the Oakland Raiders documents all the best moments and personalities in the history of the team, but also unmasks the regrettably awful and the unflinchingly ugly. In entertaining—and unsparing—fashion, this book sparkles with Raiders highlights and lowlights, from wonderful and wacky memories to the famous and infamous. Such moments include the "Sea of Hands" catch that helped the Raiders best the seemingly unstoppable 1974 Dolphins, the long passes of "The Mad Bomber," as well as the unresolved "Immaculate Reception" controversy and the infamous "Heidi Game" of 1968. Whether providing fond memories, goose bumps, or laughs, this portrait of the team is sure to appeal to the fan who has been through it all. Genuine fans take the best team moments with the less than great, and know that the games that are best forgotten make the good moments truly shine. This monumental book of the Minnesota Twins documents all the best moments and personalities in the history of the team, but also unmasks the regrettably awful and the unflinchingly ugly. In entertaining—and unsparing—fashion, this book sparkles with Twins highlights and lowlights, from wonderful and wacky memories to the famous and infamous. Such moments include the World Championships of 1987 and 1991 and the miraculous years when Bud Selig almost contracted the franchise, as well as the outrageous number of losses by Terry Felton and when manager Billy Martin punched out his starting pitcher in 1969. Whether providing fond memories, goose bumps, or laughs, this portrait of the team is sure to appeal to the fan who has been through it all. Genuine fans take the best team moments with the less than great, and know that the games that are best forgotten make the good moments truly shine. This monumental book of the New England Patriots documents all the best moments and personalities in the history of the team, but also unmasks the regrettably awful and the unflinchingly ugly. In entertaining—and unsparing—fashion, this book sparkles with Patriots highlights and lowlights, from wonderful and wacky memories to the famous and infamous. Such moments include the impressive Super Bowl seasons but also the horrendous years in the late 1980s and early 1990s. Whether providing fond memories, goose bumps, or laughs, this portrait of the team is sure to appeal to the fan who has been through it all. Genuine fans take the best team moments with the less than great, and know that the games that are best forgotten make the good moments truly shine. This monumental book of the Philadelphia Eagles documents all the best moments and personalities in the history of the team, but also unmasks the regrettably awful and the unflinchingly ugly. In entertaining—and unsparing—fashion, this book sparkles with Eagles highlights and lowlights, from wonderful and wacky memories to the famous and infamous. Such moments include the 1960 Championship game where the Eagles managed to defeat the Packers, as well as the Terrell Owens saga and the untimely death of Jerome Brown. Whether providing fond memories, goose bumps, or laughs, this portrait of the team is sure to appeal to the fan who has been through it all. Genuine fans take the best team moments with the less than great, and know that the games that are best forgotten make the good moments truly shine. This monumental book of the New York Rangers documents all the best moments and personalities in the history of the team, but also unmasks the regrettably awful and the unflinchingly ugly. In entertaining—and unsparing—fashion, this book sparkles with Rangers highlights and lowlights, from wonderful and wacky memories to the famous and infamous. Such moments include the end of the Stanley Cup curse in 1994 as well as the years of futility in the 1940s and 1950s, when the Rangers struggled mightily. Whether providing fond memories, goose bumps, or laughs, this portrait of the team is sure to appeal to the fan who has been through it all. Genuine fans take the best team moments with the less than great, and know that the games that are best forgotten make the good moments truly shine. This monumental book of the Pittsburgh Pirates documents all the best moments and personalities in the history of the team, but also unmasks the regrettably awful and the unflinchingly ugly. In entertaining—and unsparing—fashion, this book sparkles with Pirates highlights and lowlights, from wonderful and wacky memories to the famous and infamous. Such moments include the impressive run to the Super Bowl in 2006 and the great plays of Ben Roethlisberger, as well as the horrendous years in the 1980s, when the Steelers struggled below .500 three out of four seasons. Whether providing fond memories, goose bumps, or laughs, this portrait of the team is sure to appeal to the fan who has been through it all. Ted Kulfan talks to NHL Home Ice about GBU: Red Wings. Fox Detroit mentions The Good, the Bad, & the Ugly: Detroit Red Wings. 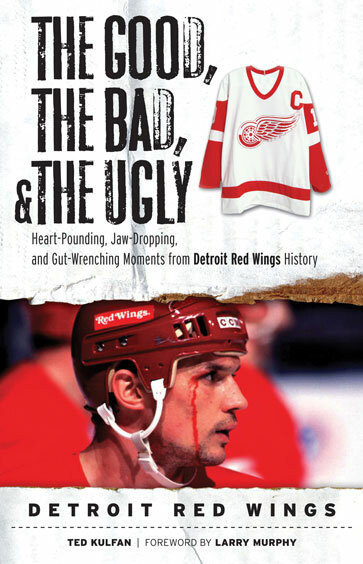 The Detroit News mentions Ted Kulfan's The Good, the Bad, and the Ugly: Detroit Red Wings. What fans don’t love to relive the good times of their favorite team? Likewise, in a twisted sort of way, what fans can really resist a self-pitying look back on some of those times that tested their allegiance? Those forgettable games, seasons, and plays that made the good times even better? The Good, the Bad, and the Ugly Detroit Red Wings by Ted Kulfan (Foreword by Larry Murphy) presents all the best moments and personalities in the history of the Detroit Red Wings. It also unmasks, but doesn’t revel in, the bad, the regrettably awful and the unflinchingly ugly. In entertaining—and unsparing—fashion, this book sparkles with Red Wings highlights, lowlights, wonderful and wacky memories, legends and goats, the famous and the infamous. You’ll enjoy stories about legends including Steve Yzerman, Gordie Howe, and Chris Chelios, the Jeri Fischer incident, coaches, and the unforgettable Stanley Cup titles. The Good, the Bad, the Ugly Detroit Red Wings includes the best and worst Red Wings teams and players of all time, the most clutch performances and performers, the biggest choke jobs and chokers, great comebacks and blown leads, plus overrated and underrated Red Wings players and coaches. There are Red Wings you loved for all the right reasons, and those you couldn’t stand, sublime and embarrassing records, and trades, both savvy and savagely bad. Brawls and fights. Rivalries. Famous Fans. Compelling photos. And much, much more. If you’re a through-thick-and-thin Red Wings fan, The Good, the Bad, and the Ugly Detroit Red Wings is especially for you. It will remind you of the good and great times and bring a knowing smile about some of those other times, when you proved to yourself just how loyal you are. For everyone else, this warts-and-all portrait of the Red Wings will provide countless fond memories, goose bumps, and laughs. Ted Kulfan covers the Red Wings for the Detroit News. He grew up in Dearborn and attended Fordson High School. (He is a proud, proud Tractor.) He went on to Wayne State University and graduated with a journalism degree (proud Tartar, er, Warrior). Ted loves all sports, enjoys playing basketball (except when his young son beats him in horse), taking long walks, and defeating his wife in checkers and card games. Oh, he also enjoys pizza — and most seafood.